Healthy Fit Goddess: 5 steps to be a "nutritarian"
5 steps to be a "nutritarian"
Vegetarian, vegan, pescatarian, flexatarian, pescavegan, etc. I'm so tired of all of these lifestyle/diet labels! Meat-eaters call me vegan, but I eat fish and eggs, which then makes vegans call me a "poser." So I'm adopting a new term that I saw on a comment on The Athletarian blog...nutritarian. I eat nutritious foods that fuel my body. Being a nutritarian is actually becoming a thing! Here are my five simple steps to becoming a nutritarian. And remember, this is a lifestyle and not a diet. 1. Food is Fuel. The number one rule is to treat food as fuel for your body. Is that doughnut really going to provide energy for your organs to function properly? Is that mac and cheese going to power your muscles during a workout or just end up on your stomach as fat? While getting to a healthy weight means burning more calories than you take in, keeping a healthy weight is all about the quality of the calories that you eat. 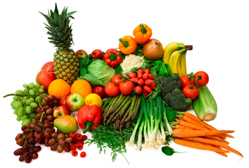 If all of the food that you eat is nutritious and your body uses it, it will not get stored as fat. The easiest way to make sure that food is going to fuel your body is to make everything from scratch and use a lot of plants (see step #2). However, if you must buy processed foods, read the label. Don't buy it if you can't understand the ingredients. 2. Live Plant-Based. When planning a meal, people usually pick a meat or fish as the main event and then match veggies and other foods as sides. Often, we forget about the importance of the veggie sides and therefore our dishes lack the important nutrition provided by plants. Why not center your meal around the plant instead? Start in the veggie section of the store and pick a vegetable that's on sale, in season, or looks particularly fresh and delicious. Then, think about what kind of meal you can make with this vegetable. Brussel sprouts would make a great casserole or grilled asparagus is delicious, for example. Then buy the ingredients for the rest of your dish. If you make plants the main event of your meals, you'll have an easier time getting all of the servings you need in a day. 3. Beware of Dairy. Humans are the only species that eat/drink the milk of another animal, and the only ones that drink milk as adults. Let's go back to the purpose of milk in mammals...mother's milk is meant to feed a baby so that it will grow. Therefore, cow's milk is meant to turn a small calf into a huge cow. So, the only real reasons humans should drink cow's milk are if they are malnourished or want to grow larger in size. There is no other nutritional value to milk that you can't obtain from plants (including calcium). Have you ever tried eating dairy-free? You'd be surprised at how much better you feel, even if you are not lactose-intolerent. You'll experience less bloating, less stomach fat, and a healthier digestive system. 4. Brown not White. Breads and pastas are really hard to give up unless you're gluten-intolerant and they make you sick. You can enjoy carbs in moderate amounts and still be healthy. Just make sure to eat whole-grain, unbleached breads and pastas and brown rice. Anything that is white has been bleached and deprived of most nutrients. White carbs will not give you the energy that you need. 5. Sugar is the Devil. Numerous studies (and common sense) show that no amount of processed sugar is good for the body and that it can even be harmful by increasing the risk of diseases such as cancer. See my post on Obesity and Sugar Tax. Processed sugar will not be used by your body for energy and will be stored as fat. You should avoid it as much as possible. This is tough because sugar is not only in sweets but in almost any processed food. I avoid sugar in processed foods like ketchup and peanut butter by buying products that are sweetened naturally with honey or agave nectar. Real maple syrup and coconut oil also make good sweeteners. While they still contain sugar, as do fruits, the sugar is in an unprocessed form that will actually be used by your body and give you energy. Fake chemical sweeteners (such as in diet coke) are also bad, but that's a whole other post. Do you already follow some of these rules? Do you have any more healthy eating rules? Half marathon training has started!